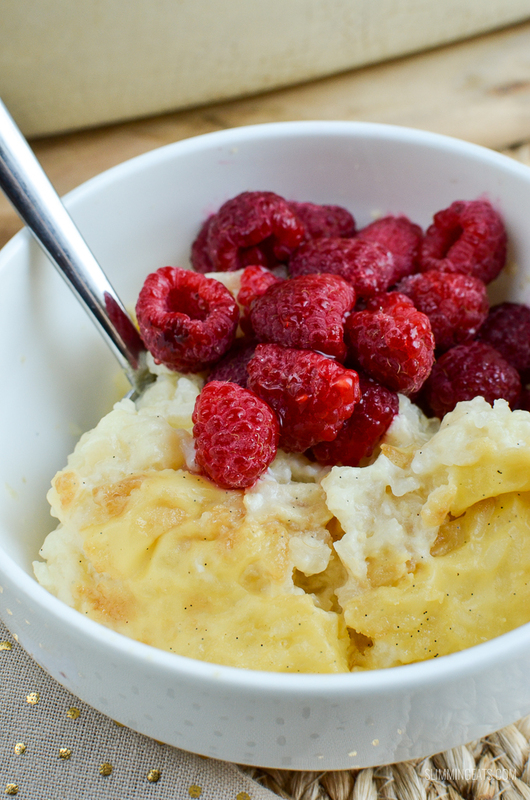 Forget regular rice pudding, this Low Syn Baked White Chocolate Rice Pudding is to die for!! 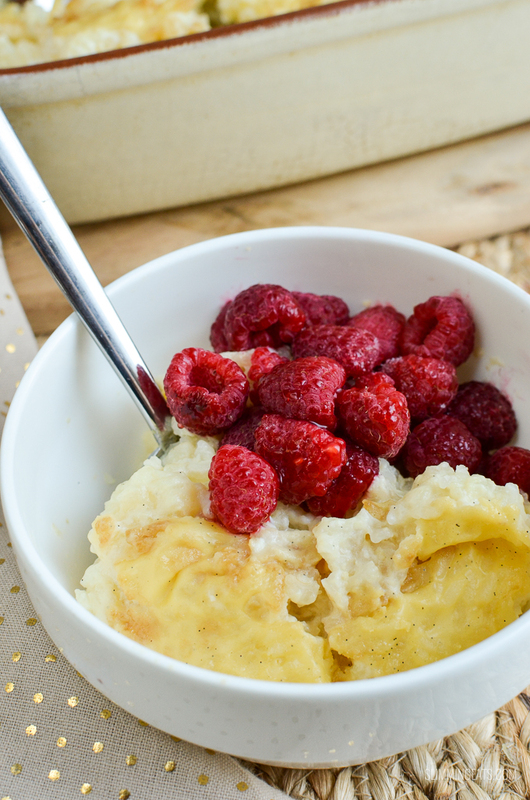 I recently had a craving for rice pudding, but for some reason all I could think of for flavour was White Chocolate. Regular white chocolate is pretty high in syns, but White Chocolate Option is pretty low and great for adding that white chocolate taste. I sometimes add it to vanilla yoghurt, if I fancy something decadent to dip some fruit in. I figured it would be great added to some creamy milk rice for a Baked White Chocolate Rice pudding and boy was I right!! For those wondering what White Chocolate Options is, it is basically a low calorie hot drink, like hot chocolate, you can get various other flavours, including Milk Chocolate. Now I have to add, the ingredients in the White Chocolate options are not ideal, and most are things I would usually avoid, but for an odd low syn treat, I don’t worry too much about it, as I eat relatively clean the majority of the time and white chocolate in any form isn’t really healthy anyway. If you don’t like white chocolate, you can use the milk chocolate options, or even some 100% cocoa to keep this super healthy, but you will have to taste test and add a sweetener of choice, as 100% cocoa is pretty bitter and not sweetened at all. 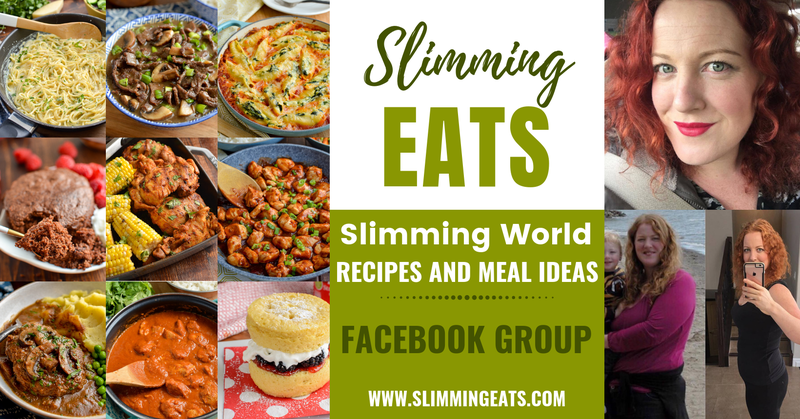 You don’t even have to add any chocolate flavour, just keep it as vanilla flavour, or add a bit of cinnamon or even some sultanas for a few extra syns for a nice variation. Just be aware if you are varying the flavour, you may need to adjust the sweetness, so taste test before baking. 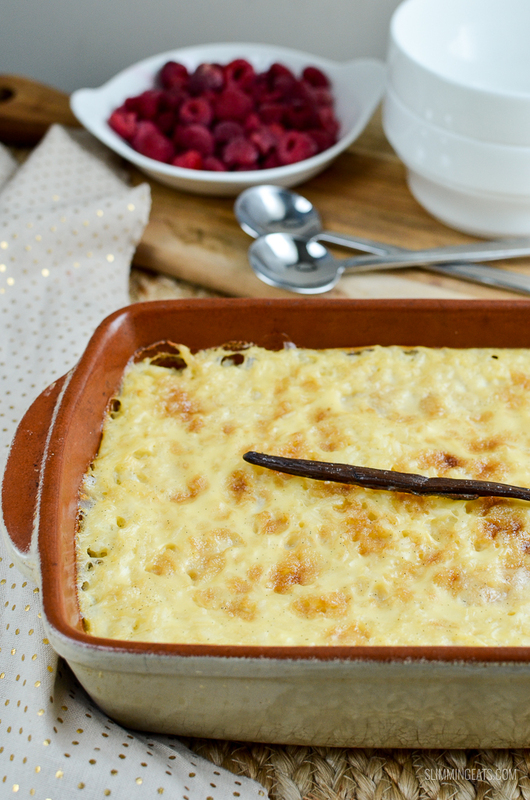 My choice of sweetener in this Baked White Chocolate Rice Pudding is Sukrin Gold which is a great natural tasting sweetener and perfect as a brown sugar replacement. I have tried many different types of sweetener in the past trying to find one that is natural and tastes natural and I think this is it. I usually just use some syns on honey or maple syrup, but it’s nice to know I can now use this and reduce the syns even further. 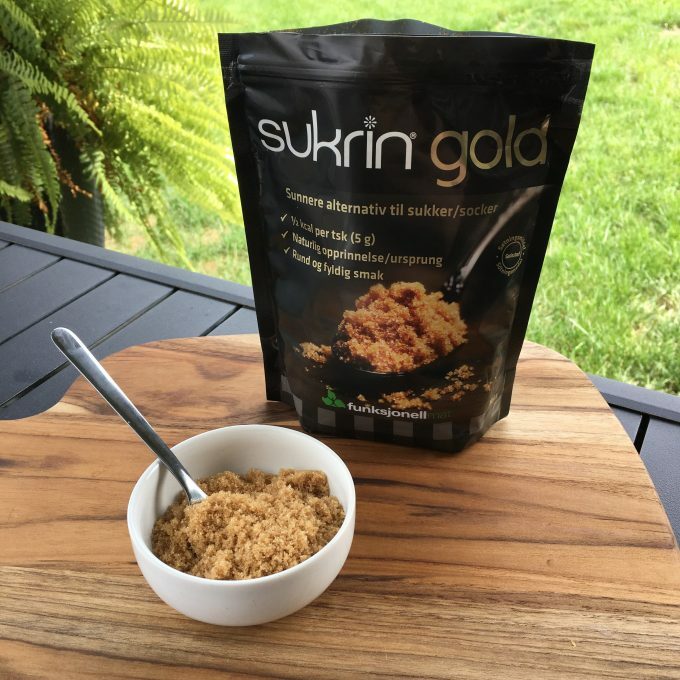 Sukrin can be ordered on Amazon, and from various health food stores. 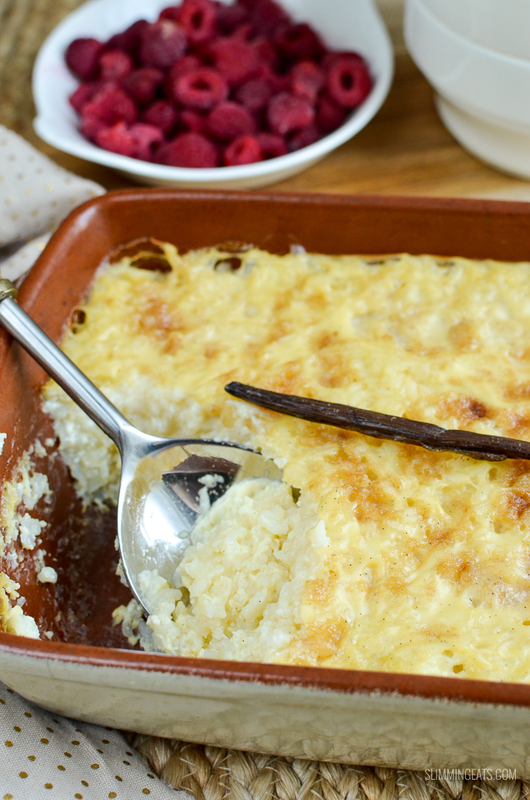 For this Baked White Chocolate Rice Pudding, I also use 2% milk instead of skimmed, because it is slightly more creamy in this recipe and rice pudding just has to be creamy right? 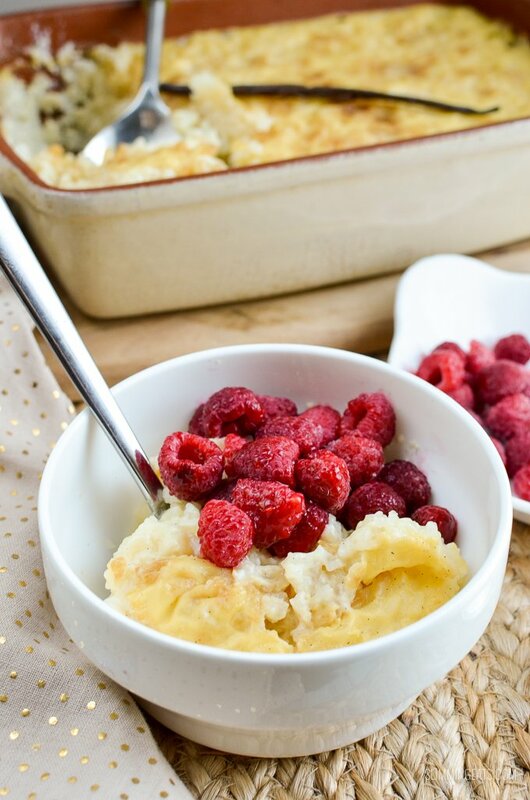 This Baked White Chocolate Rice Pudding is delicious in a bowl just as it is, or topped with some fruit of you choice. I love raspberries or if I have a few extra syns a dollop of jam is just perfect!! Enjoy this for breakfast or dessert. 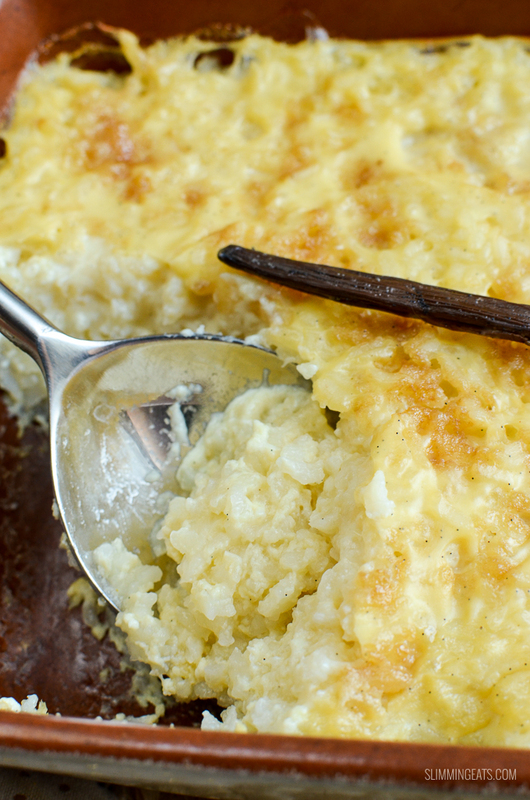 If you prefer a traditional rice pudding, skip the baking part and just simmer on a low heat on the stove till creamy and it’s ready to serve. 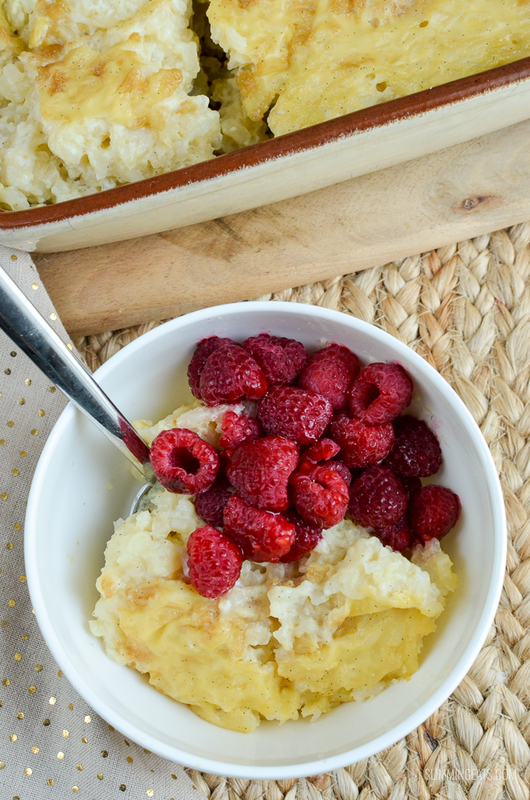 Whichever way you make it, you’ll will love this rice pudding dish. Looking for some more dessert recipes? 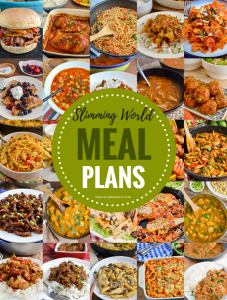 Check out these Dessert and Cake recipes – there is plenty there to keep those cravings at bay while still sticking to the plan. Add the rice to a saucepan filled with 2 cups (480ml) of water, bring to a boil, then reduce heat to low and cover with a lid, simmer until all water is almost absorbed. Whisk in ¾ of the milk, the white chocolate options, 3 tbs of sukrin:gold (add one tbs at a time and taste test for sweetness)and scrape some seeds from the vanilla pod until no visible lumps. Whisk the egg together with the remaining milk. Add this into the rice with the vanilla pod. Heat on a low heat for a couple of mins stirring until creamy. Bake in the oven for approx 45 mins until rice is set and lightly golden on top. Serve as is or with your choice of fruit. 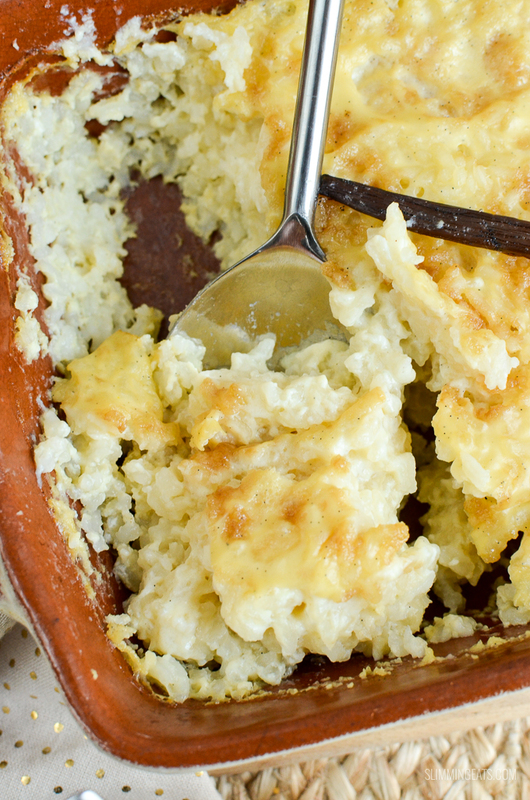 If you prefer a traditional style unbaked rice pudding. You can skip the oven process and instead just gently warm in a saucepan until creamy. This looks good – is it? I don’t often find SW-friendly desserts I like, most just take like chemical sweetners to me. It looks yammy. Def going to give it a try. This was amazing, all the family loved it. This was the best I’ve tasted! But why did mine curdle? Hi Sarah, I’m not sure why yours curdled, i’ve Never had that issue, I make this regularly. 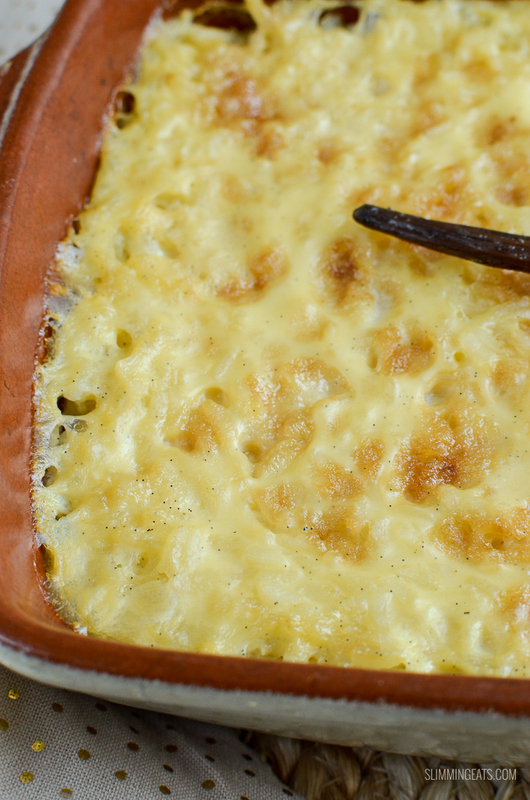 Did you whisk the egg with the remaining milk before stirring into the rice, making sure the heat was low? Any substitutes for anything?